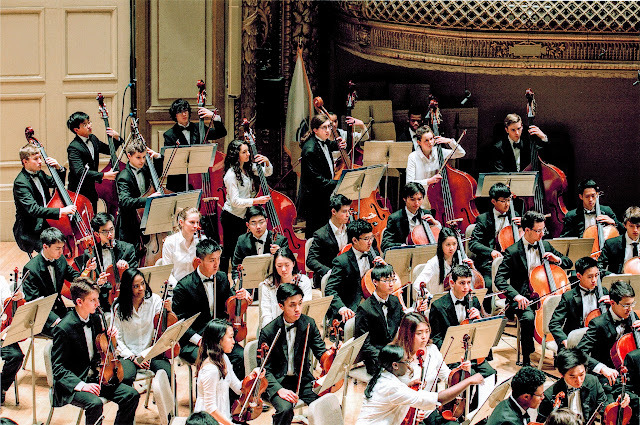 "Auditions are challenging, but they will always be part of your life as a musician." We read this quote from a high school music camp brochure. "Challenging" doesn't even begin to describe the levels of anxiety and dread that both my children experience when they have to audition for a musical activity. Both kids are talented in music in their own way, but auditions are the one thing that completely demolish their confidence in life itself. With Adam, you would think he would be a pro at auditions, having auditioned for two orchestras on violin, with seating auditions every year (every time he would say that he got last seat, but always ended up near the front) as well as two stints in the Junior District festivals. Lots of auditions, but he dreaded every one. For the first district festival, he auditioned on both mallet percussion and jazz bass and made 2nd seat in mallet percussion for the concert band. For the second festival, he auditioned for both again, and he made the one and only bass seat for the jazz band. He had auditioned with the electric bass guitar in January of that year, and at the same time started lessons on the upright bass. By April, he was able to switch to the upright bass for the rehearsals and performance. Woo hoo! Each time, Adam refused to audition for the junior district orchestra on violin (two auditions are enough, mom!). Last year, we were traveling during the senior district performance, so he managed to avoid auditioning for his first shot at the senior district festival as a Freshman. This year, we were not going to let him slide on district auditions! 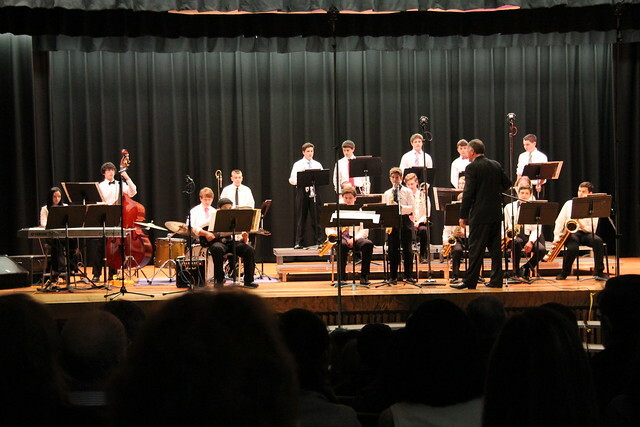 As a change from the junior festivals, he auditioned on the double bass for the orchestra, and not the jazz band, because he wanted the experience of playing in a big orchestra with other basses (usually being a section of one or two). Also, one audition is enough! Do you think he has a pushy mom? Adam had months to prepare a relatively simple Bach Gavotte (which he played on violin years ago from Suzuki book 3), and obtained the 2nd highest score. The senior district festival performance was in the grand venue of Worcester's Mechanics Hall (he is under the middle pillar on the right side). One of the pieces, Glinka's Russian and Ludmilla Overture, was so fast and difficult that he actually had to practice it and still had to fake his way through it. The top three out of seven basses from the district festival were recommended to audition for the Massachusetts All-State Orchestra. With all his other commitments, Adam only had about a month to prepare for this audition. The piece required, Handel's Sonata in G minor, was a bear of a piece in high registers, and he had to learn all four movements. Plus a lot of it was written in tenor clef, so he had to learn to read a whole new clef! Through the holiday season, he also only had three lessons to work on this piece with his instructor, so I took it upon myself to help him learn the piece, writing in the notes for tenor clef. I also accompanied each practice session on the piano, pushing him to practice every possible day (like a good tiger mom should). In the beginning, it was really rough and looked pretty hopeless. But by the end, it was definitely presentable, although the fast movements were not up to tempo. 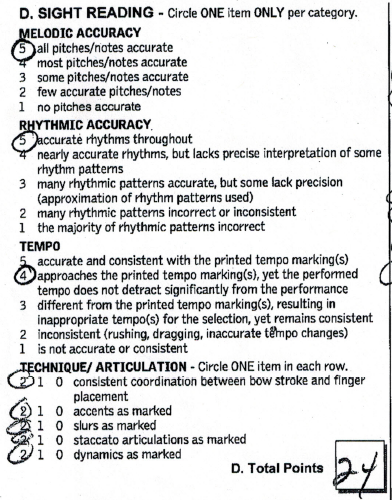 I also helped him with musical phrase shaping, an area where he had gotten lower marks in the district audition. By the day of the audition, Adam was complete wreck. He felt that he hadn't gotten enough time to prepare the piece, and he didn't have all his melodic minor scales memorized. He wanted to back out of the audition and didn't understand why I signed him up in the first place. I tried to calm him down on the drive over, saying that if anything, it would be a learning experience (the adult's consolation prize for everything!) and that it would help prepare him for next year. Adam auditioned alongside about 10 instrumentalists from his school. Some were nervous, some were confident. Adam was in the new low category of nervous AND despondent. 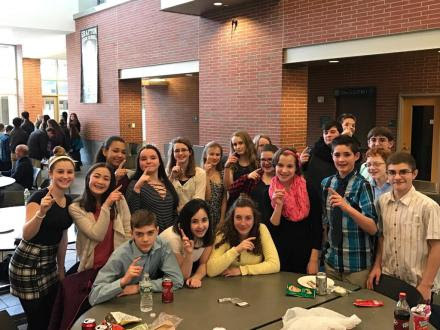 His band director was helping to tabulate scores, and he stopped by before the audition and asked Adam if he was ready because there were a "lot of low scores in the basses". Hmm, that could mean two things, either the other bassists were completely bombing, or the judges were super tough. I took it as the first, that Adam would have a better chance because other bassists weren't doing well. I'm sure Adam took it as the second. During the warm-ups and audition, I had another conversation with his director. Director: Do you think Adam is ready? Me: Yes, I've been whipping him. Me: I've been working extensively with him, accompanying on the piano and stuff. Director: Well, Adam's very good, but All-State requires a much higher level of performance. I'm not sure if he realizes that and whether he's up for it. Director: How did you do? Adam: I did badly. My tone was bad and I messed up my minor scale. Also I messed up counting the rests in my piece because the clock ticking on the wall distracted me. Director: How was your tone bad? Adam: My hand was shaking too much and I ran out of bow on the long notes. Adam: Oh, that was fine. I don't think I could even manage all perfect notes, rhythm, articulation and dynamics! I joked with Adam asking why he didn't get a perfect score on tempo. He said that it was marked at 72 beats per quarter note, how was he supposed to know how fast that was, was he supposed to be a human metronome? I was impressed that he remembered the tempo marking, a lot of performers wouldn't even notice it under the circumstances. Human metronome training next (just kidding)! Adam's All-State experience was great, although the only response we got from him was that he was really tired. 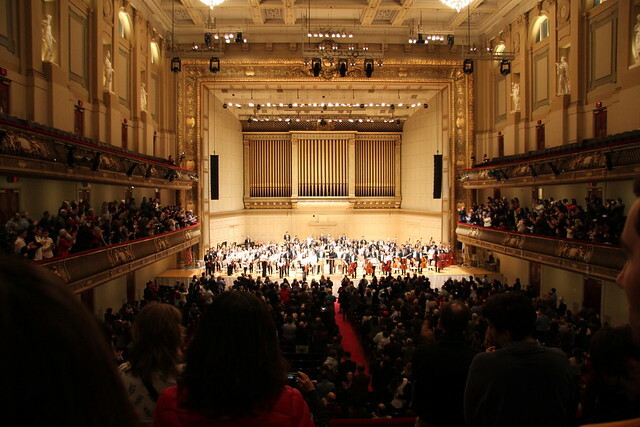 They performed at Boston's Symphony Hall. Adam is under the pillar again (mixed pair seating order). 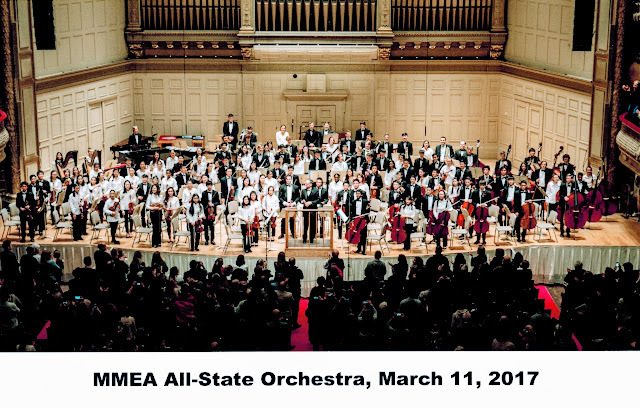 Did I mention that it was at Symphony Hall? Consistently ranked as one of the top 5 acoustic concert halls in the world? 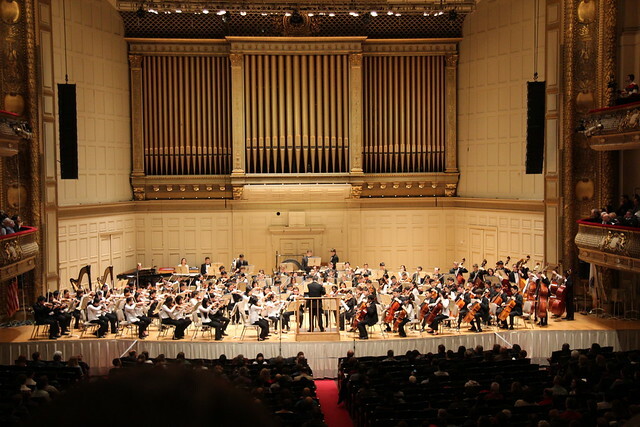 Yes, Symphony Hall to a packed house! Dova, on the other hand, has been doing less and less music, opting to focus on gymnastics. She quit the concert band and jazz band this year, but remained in the chorus. We've never fostered Dova's singing, as she never expressed any real interest in it. I offered her private singing lessons in the past so that she could get into the Select Chorus at school, but she declined and managed to get in on her own. That came as an offhand remark from Dova earlier this year, "Oh by the way, I auditioned for Select Chorus and I got in". Every time she sings at home, it's usually one of those unpleasant repetitive pop songs, so we ask her to stop. But we do let her sing away in the shower. This is the first year she was eligible to audition for the junior district festival, and her choir director basically required everyone old enough in select chorus to audition. They worked on the audition piece and other requirements outside of school several times a weeks leading up to the audition, so Dova didn't prepare beyond that. On the morning of the audition, Dova was completely out of sorts because she claimed that she had no nice clothes to wear. I tried to pick out a pretty sweater and blouse with pants, but she insisted that she had to wear a dress which she didn't have. All this fuss was just to cover the fact that she was petrified of the audition. After finally getting her to wear clothes that she would accept, she started crying about audition, how she wasn't any good and that she never practiced. I tried to calm her down reminding her about all the rehearsals that she had with her choir teacher. She always came back with, "But you know I can't sing!" I brought up the fact that she was in select chorus, so she had to be able to sing. She thinks that she got in only because the choir director was super cool and let her show off her piano skills during the audition. At this point, we had to drive to school for the bus taking the students to the audition site. In the car, she wailed and screamed. I thought to myself that I just needed to stay calm, not say anything that would make it worse, and get her on the bus. Her eyes were swollen and face was tear-streaked and I was afraid that she wouldn't go. She brought up the time she auditioned for a music camp placement years ago and how she cried at the audition because she played the first note wrong in sight-reading. I had forgotten about that. It's amazing what horrors kids can dredge up when they are upset! When we arrived at school, I asked whether she wanted me to walk her to the bus, but she went by herself, red teary-eyes and all. Whew, my job done! You would never know from this picture taken at the audition that Dova (2nd from left) was completely distraught an hour before. And her choice of clothes are just fine! When we picked her up, she said that she did poorly (just like Adam), but she did do well on her intervals. She said her voice was really shaky during the whole audition. I can imagine that most kids would sound shaky under the circumstances, so judges must take that into consideration! 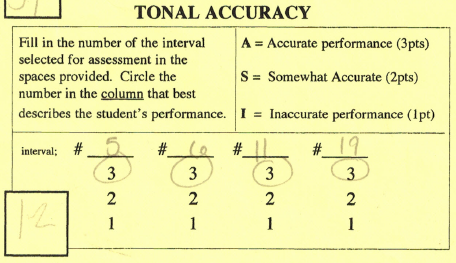 We learned a few days later that Dova was accepted into the district chorus, with a perfect score in "tonal accuracy". Wow! That's a testament to innate musical ability! In the end, Dova wasn't able to attend the junior district festival because the performance date conflicted with her gymnastics state meet. She attended the first rehearsal, because at the time, we didn't know for certain whether the gymnastics meet would conflict (50% chance of falling on the same day). We then learned that she would be disqualified from participating next year's festival if she went to a rehearsal and didn't attend the concert. I put in a request for an exception in her case because, "The rules as they stand are not flexible enough to allow for an elite athlete to participate in this festival." In the end, the audition experience has given Dova new confidence in her singing. She had an amazing experience singing alongside other talented singers at the first rehearsal. Even if she can't participate next year, she felt it was worth that one rehearsal. Let's cross our fingers for next year!